This is cross-posted from The Chicago Council on Global Affairs. Read the original article here. Basilinna CEO, Deborah Lehr, joined a panel of distinguished speakers on January 26, 2017 to debate "The End of the Asian Century," the title of Michael Auslin's latest book. Dr. Auslin, a historian, Resident Scholar and the Director of Japan Studies at the American Enterprise Institute and panelist, developed a risk map for Asia in five key areas that bring into question the continued rise of the region. Also joining the panel was Karl Friedhoff, a Fellow on Public Opinion & Foreign Policy at the Chicago Council, who discussed the changing demographics of the region and its impact on attitudes, economic growth and political reform. Ms. Lehr focused on the U.S.-China relationship as the largest determinant of relations in the region. 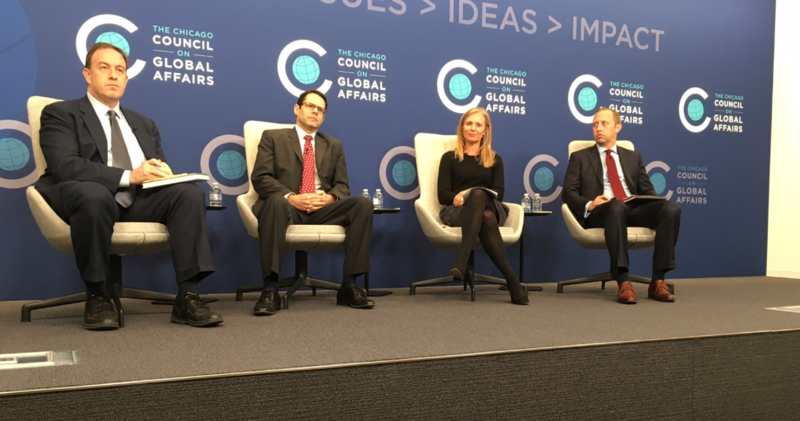 The Chicago Global Affairs Council hosted the event, with the panel moderated by Dr. Phil Levy, Senior Fellow on Global Economy with the Council.